Dandelion “Honey” | Have YOU Ben Starr Struck? Either you love dandelions, or you hate them. If you hate them, it’s probably because you spend so much time trying to rid your lawn of them. If you love them, it’s because the big, soft, bright yellow blossoms and supremely blow-able puff balls bring you back to childhood. Or perhaps you’re one of the few who know exactly how edible the dandelion is. All parts of this miraculous weed are delicious, from the roots (which can be roasted and ground into chicory…a popular additive or substitute for coffee, particularly in Louisiana), to the leaves (which are crisp and tangy with a slight bitterness, like arugula, provided you pick them before the plant blossoms), to the yellow petals which are fragrant, tangy, and lightly sweet. (Avoid the green sepal that holds the petals together unless you are cooking the blossoms…it can be a bit bitter for raw eating.) 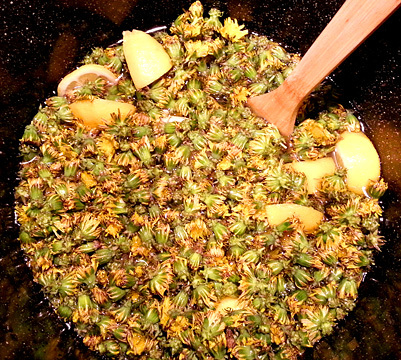 When you harvest the blossoms, use or refrigerate them quickly. They will start to close up. They can still be used for this recipe even if they are closed, but if you want them open to use the petals, you need to use them quickly. As a note of curiosity, dandelion blossoms open every morning for 3 days, closing up around noontime. On the 4th day, they open as the puffballs that kids love to play with. Bring everything to a rapid boil, then reduce the heat to maintain a rolling boil. Boil for 2-3 hours until the appearance of the boil changes from looking more like water boiling to very glassy, sticky bubbles and the color of the liquid has turned deep golden. Then VERY CAREFULLY pour the liquid through a large strainer or colander into a heat-proof bowl or pitcher. (Hot sugar syrup sticks like crazy and is much hotter than boiling water so be extremely cautious.) Using tongs, carefully remove the pieces of lemon from the dandelions and set them on a plate to cool. 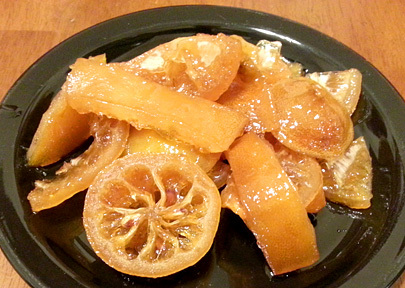 These are now candied lemons, with an incredible flavor and texture. Chop them up and serve them for breakfast…they are delicious on toast or biscuits or pancakes, or use them on top of ice cream or inside fruit pies. Or dip them in chocolate. They are DIVINE! Let the syrup cool completely, and now you’ve got about 3 quarts of an incredibly delicious syrup that is wonderful on pancakes or waffles. (We served them over an acorn buckwheat waffle for dessert at FRANK and people lost their minds.) This amount of syrup is enough to last you all year until the next dandelion harvest, or double the recipe and share with friends. They will demand the recipe. Many thanks to you, Katja, for sharing this time-honored recipe from your family. I felt honored making it and sharing it with my own family and with guests at my restaurant. To me, all recipes with such a story taste infinitely better because the legacy of those who prepared it for generations past can be TASTED in the final product. This recipe will become a tradition in my family from now on! 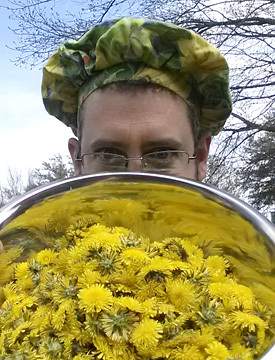 This entry was posted in Breakfast, Desserts, Recipes, Side Dishes, Vegetarian and tagged blossoms, dandelion, forage, foraged, honey, syrup, vegan, wild. Bookmark the permalink. Very cool. And very cool that you got a NEW recipe to try. Now if I can just collect enough CLEAN dandelions! Hi Honey! [I just had to say that, after the title above ; ] I have always liked dandelions because they are chock-full of Vitamin A and I feed them to my African Grey, Betsy (I tried them, but they are a little too bitter for me). But – I never knew the information you gave above about the blossoms – that’s fascinating! Thanks Ben!